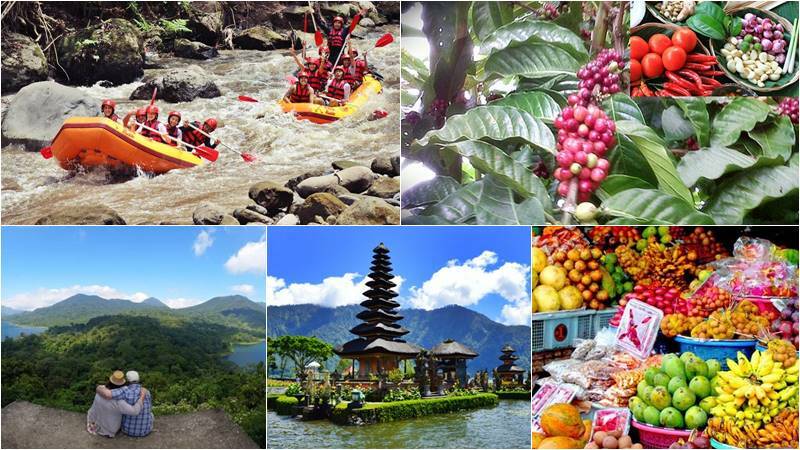 Bali Rafting + Three Lake Tour is an amazing Bali Rafting Tour Package which combines whitewater rafting on the Ayung River with other favorite tours: visit Luwus Spices Garden to see every type of spices growing in the village and enjoy the wonderful view from the Gobleg Hill of the Twin Lake. Visit Ulun Danu Lake Temple with its towering pagoda and spend your time at Bali’s botanical garden as well as Candi Kuning’s fruit and vegetables market. 14.30 – Visit Luwus Spices garden. 16.00 – Visit Gobleh Hill with twin lake view. 16.30 – Visit Ulun Dhanu Lake Temple. Your Bali Ayung rafting tour begins with morning pickup by our driver with private air-conditioned car from your hotel in Bali and drive through the countryside and arrive at village of Payangan, Ubud Bali. After all participants are equipped with rafting equipment including lifejacket and helmet, it is time for you to experience a truly unique and memorable epic journey thru winding gorge, luscious jungles, and wild life in its natural homes. Paddle through astonishing waterfalls for unparalleled river fun. Our trained professional guide with internationally accepted equipment will guide you through about 12 km of exciting grades II and III rafting. Your safety is our highest priority always and after 2 hours of Ayung river rafting fun trip. After your shower and change, the Indonesian Buffet Lunch will be served to you while you enjoy views from the stunning restaurant and relax in a peaceful atmosphere of Bali. Buffet Indonesian Lunch will be served at finish point restaurant after shower and changes. Take a walk to the local spices garden, where all the spices that grow in this village can be seen. In Bali, Botanical Garden is unique as a botanical research, conservation, education and recreation site. It offers a place to relax in the beautiful and peaceful environment while learning about the plants used by the Balinese in their day-to-day lives and the many interesting rainforest plants and bird life. The Bali Botanical Garden is 1250-1450 meters above sea level within 157.5 hectares (389 acres) of land. The temperature drops to about 17-25 centigrades by day to 10-15 centigrades at night with a 70-90 percent humidity. The weather is unpredictable and warm clothes, umbrella or rain coat should be prepared. During our visit to the forest, we stop at the Cactus Collection, the collection of orchids and stop at the statue of Kumbakarna Giant. Asah Gobleg is the name of the village where people live on the top of the hill. From this spot, the view from Buyan and Tamblingan lake with hills and thick rainforest is magnificent. Visitors will also see the monkey appearing from the jungle on the plateau. Ulun Danu Beratan Temple is a temple on the edge of a huge crater dedicated to the lake goddess. The temple was built in the 17th century in the honor of the main Hindu Trinity of Brahma-Vishnu-Shiva and the goddess of the lake of Dewi Danu, on the northern Bali islands. The sight of the northern Bali Islands and the cool atmosphere of the Bali mountains made this lake and temple a favorite attraction and recreation spot, as well as a frequently photographed spot. Visitors can also rent the boat and view the temple from the center of the lake. Stop at the center of Bali’s market for vegetables and fruits, take your time walking around this market with a chance to take some nice photo shoot.